The big job over the refurbishment was stepping back from HTML 5 tags section and article - the reason behind this was rendering in Internet Explorer. I use Google Analytics on my site and recently read a post on forrst about browser versions and got interested in what my statistics say on visitors' browsers. 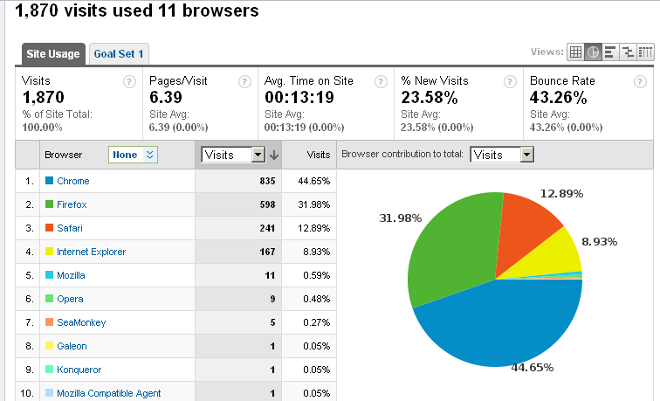 As the stats show, around 9% of my visitors are having a go with IE but up to now, would have seen a mess. So I would like to apologise and welcome you to this design. The word on the street is that Microsoft will be taking up some html 5 tags in the next version of it's famous browser. I am looking forward to seeing that. I found a great web design tool from a Mashable article called MockFlow. The flash based app allows you to design and test web layouts from scratch or from existing templates. The drag and drop interface is very easy to use and there are all kinds of different content types available to add to your design. For example: buttons, text, bullet lists, charts and lines etc. I am trying out a few box ideas for an updated design to my homepage. You can share your designs with others, collaborate and export it to a variety of different formats including powerpoint and PDF. With the ability to upload your own images, link to other pages with seperate designs and use already made common components, it is really quick and easy to put together a mockup of a site. You can check to see your statistics, if you have a Google account, over at Google History. 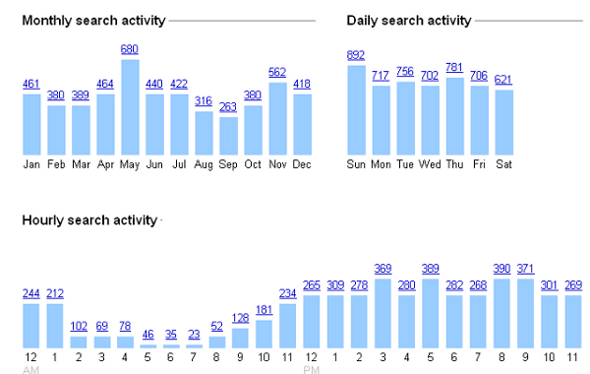 You can also check out trends including most searched for terms, top clicked sites and search activity over time (mine shown here). Yes I know! Googling your name may be a bit vain but also perhaps a good idea! Perspective employers etc are likely to do a quick search for your name and you want your best to come up top rather than some rubbish. My site appears 4th on Bing and 11th on Google when queried with Dylan Jones. However, searching Dylan James Vernon Jones my Facebook page is top of Bing and nothing of me can be seen on Google. This may be due to the fact I do not have my full name in an easy to read format. It is embedded, however in a hCard on the home page. Never mind, maybe this post will help! 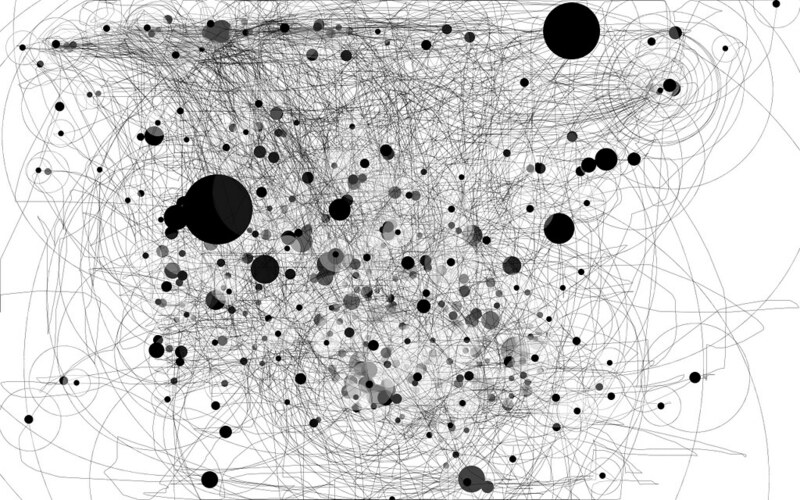 This image shows 1 hour of my mouse movement - the large black circles indicate where the mouse was stationary for periods of time.